Breakfast, lunch, or dinner, this freestanding gas range helps you handle any order, while you monitor progress through the EasyView™ extra-large oven window. On the cooktop, a center griddle fits over the fifth burner, making a larger cooking area that helps with pancakes, tortillas, or grilled cheese. Inside the oven, the two adjustable oven racks accommodate large meals, and you can use them as cooling racks outside of the oven. 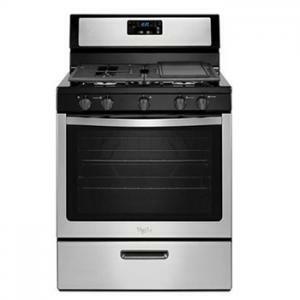 The lower drawer broiler allows you to bake and broil at the same time, so you can serve everything on schedule. Master whatever meal you're making.